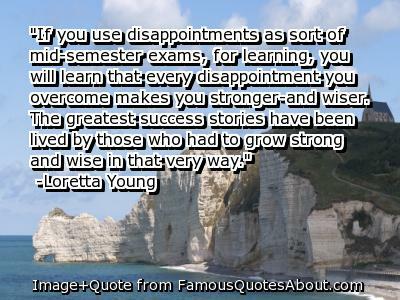 Disappointed? Use that feeling to light a fire under your tush! Don’t you hate when disappointing news can ruin a perfectly wonderful day? Happily exhausted from a play date with a few friends and their kids, I was thinking about how lucky I was to be able to enjoy this time with them. But what was making me extra-cheerful was an upcoming job interview with the English Chair at my local community college to be an adjunct writing professor. While I love the flexibility of being a freelance writer so I can stay at home with my little ones, I was thoroughly excited about the prospect of teaching as well as contributing more money to our household. But just as I was leaving the play date, I checked my voicemail and listened to the English Chair’s assistant cancelling my appointment. She went on to explain why, but I found it hard to concentrate because my heart was sinking with each word she uttered. My disappointment was amplified because I’d also found out that I didn’t make the cut in that Hallmark competition I entered, and almost every editor I’ve contacted regarding freelance assignments over the last few months has pretty much blown me off. I’ll be honest with you, my professional self-esteem is feeling kind of shattered at the moment. It seems like doors are either closing on me or never even opening up in the first place! I needed a crankiness crusher STAT, and it couldn’t be yet another salted caramel sweet square from Starbucks. Fortunately (for my thighs), I found one in The Digital Mom Handbook. The book is written by two women (Audrey McClelland and Colleen Padilla) who left their swanky careers when they had kids and then turned themselves into super-successful entrepreneurs/mom bloggers. Their success didn’t happen overnight, of course, but I became incredibly inspired by their stories and advice. Instead of wallowing in self-pity and crying over what felt like professional disses, (although admittedly I did break down when I told a friend about my interview being canceled while chatting on the phone with her), I opted to turn off the “Real Housewives of Wherever” that I was watching and curl up on the couch with this book while everyone else in the house slept. Moral of the post? Take your frustration and turn it into motivation! There will always be disappointments in life, but it’s better to use them to your advantage than to sulk in a corner over them while scarfing down a pint of your favorite ice cream. Go for yours and get it done (and try to have fun along the way)! Previous Life is an everyday special occasion. Next New friends: A reason to practice the art of conversation. Tara…I admire you. I have to say I am WAY too comfortable in my job to ever give it up – for fear of having to interview again. I hate the thought of going through that process and think you are brave to have made a decision to be with your family – knowing someday you would cross back over that threshold. You put yourself out there all the time in your line of work. That takes courage. Not many people are truly willing to be honest like you are. Stay true and good things will come. When a door closes, a window will open. It may not be on our time frame, but good things will come professionally if you keep putting yourself out there. In the meantime, know we all love you and are cheering you on! what a great turnaround in response to disappointment. Great things await, you go girl! Go MOM!!! I don’t know if that is something you want to do on your own, but if you want help I would be glad to do what I can. You do so much for Joe and me and I can’t think of a better way to “pay you back” than to help you find a new way to share your talent! Tara, You go girl! Turn those disappointments into something positive. I have learned something else always comes around and many times it turns out to be bigger and better. I faced that disappointed feeling recently. I was asked to submit some jewelry for a magazine feature and as always your asked, and the pieces are due the next day and have to be overnighted which is never cheap! But as always your thinking I can’t pass it up so you go for it which I did…but my pieces were not used and I just saw the article while I was in the grocery line…of course my pieces were so much cooler than the one’s picked hee hee but this is the way my business is, I have had many magazines feature my creations and been on the other end when I’ve been told your in, only to be cut at the last minute. But if they call tomorrow and say we need this or that I’ll be sending it! So I guess the moral to my story is never give up, disappointments only make you work harder and become more creative…so when you are the famous cranky crusher don’t forget us little people! Tara–your posts never fail to make me smile and feel better. Glad that you found some hope and inspiration on the heels of disappointment. You’re incredibly smart & talented..it’s just a matter of positive attitude, perseverance and finding the right opportunities. You guys are all so inspirational! Thank you for your supportive comments. Perseverance is key for all of us. And I don’t know about you, but I NEVER plan on giving up!